Ten years ago, I set off for Borneo to study orangutans. I knew how closely related they were to humans, but when I actually experienced the orangutans first hand, I found the similarities fascinating. That orangutans resemble us should not be a surprise. Orangutans are great apes, our closest living relatives on earth. They are our cousins, and it is largely because we are all "family," so to speak, that we resemble one another so closely. Because of our similarities, great apes offer one of the best avenues in existence for understanding human origins and human nature. Only four species of our cousins remain alive on earth today -- chimpanzees, bonobos, gorillas, and orangutans -- and every one is at serious risk of extinction. If we lose them, we close an important window on ourselves. It was not with conservation in mind that I headed for Borneo, but orangutans' own minds. What intrigued me about great apes, as it has intrigued many others, is the possibility that their minds may be among the most sophisticated on earth. Knowing little about Borneo, rainforests or orangutans, I figured my best chance to meet orangutan minds was on shared ground. I was lucky. Shared ground existed in the form of centers that help rehabilitate ex-captive orangutans to free forest life. Ex-captive orangutans, as the name suggests, lived at one time as human captives. Some suffered abominable conditions in captivity -- tiny cages, starvation, and abuse -- but others lived as members of human families, in their homes and villages. Some of these orangutans became bicultural, comfortable with both human and orangutan worlds, and their skill with human ways offered me an exceptional avenue of understanding how their minds operate. It turned out that these ex-captives did a multitude of prodigiously intelligent things. They took canoes for rides down the river, for instance. Humans heading upriver might spot one of them cruising down; if humans were surprised, the orangutan just nonchalantly floated on by. Orangutans also siphoned fuel, made fires, washed laundry, unlocked doors with keys, weeded paths, untied the most complex knots humans could make, hung hammocks up and rode in them, cooked pancakes and brushed their teeth. Although these feats are impressive in and of themselves, simply listing them gives little feel for the complexity of the schemes orangutans concocted. One female, for instance, acted totally engrossed in a hair trimming session with a staff member, repeatedly inviting him to snip here, then there. While she kept his attention on giving her a trim, she was edging herself into a position for grabbing his backpack. She got it. And the man never suspected a thing -- even though he'd known her for six years. Another female cooked up a scheme to get soap and laundry from camp staff working on a riverside raft. She liked to play with soap and laundry, but staff didn't like her messing up their work and had posted a guard to block her access. So she detoured around the guard by canoe. To do that, she had to untie the canoe, bale it out, push it into position, climb aboard, then shove it towards the raft. She pulled the heist off flawlessly, and it was only once she had the soap and laundry that we figured how she had done it. As for how complex these schemes are, well, they outsmarted humans. Orangutan minds that can achieve these schemes are at least as sophisticated as the minds of other great apes, and they reveal abilities believed until recently to be uniquely human. Orangutan minds also show qualities not found elsewhere --exceptional reflectiveness, mechanical genius, and unexpected socially astuteness for a species known for solitude. That makes orangutans even more like us than we believed, and even more important to our understanding of human nature. 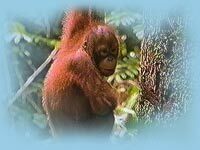 As my respect for orangutans was growing, I was increasingly seeing the abuses humans inflict on them. I occasionally accompanied confiscation teams as they followed up tips on illegally captured orangutans. On one day alone, a team confiscated three orangutans under four years old from one village. Two were in makeshift cages too small to stand up in. The third, an infant under a year old, was stashed alone, in the dark, at the bottom of an empty oil drum. Mostly, I glimpsed captivity from its aftereffects, when ex-captives first arrived at the rehabilitation center or when snippets of their histories came to light. One ex-captive was named Rantai, Indonesian for 'chain,' because she arrived still attached to one and sported chafing scars. Another's right hand, or what remained of it, was a three-fingered claw locked into a permanent crook. Many had suffered from abysmal care. One orangutan was irreversibly blind, while others were emaciated from starvation. Infections ran from diarrhea and scabies to tuberculosis and hepatitis. Parasites were simply run of the mill. Some orangutans were so badly injured that they died within days of their rescue despite medical efforts. Psychological scars were as serious as physical ones, if often less obvious. One juvenile female raised in Taiwan from infancy understood spoken Chinese, "spoke" with a few gestural signs, rode automobiles, ate in restaurants, and played the piano. Another, who had somehow ended up in a religious order, reportedly went to prayers every day. If these lives sound kindly and supportive, they left both these orangutans decidedly uninterested in forest life or other orangutans. Perhaps the worst psychological problems affected infants. You could see why people wanted them -- they are among the most charming creatures imaginable, little balls of cuddly, orange fluff. But the only way to get an orangutan infant is to kill its mother, then take the baby off her dead or dying body. So all captive infants are orphans. 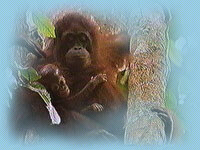 For orangutans, that alone is tragic because like humans, their mother is the center of their world for many years. It is mother that provides protection, nourishment, comfort, play, knowledge, and guidance. Worse yet, many orphaned infants are put in cages, alone, for hours or days on end. Leaving an infant great ape alone is among the worst deprivations possible. It can render them autistic-like, unable even to cope with normal events. The damage can be permanent. Seeing the abuse humans inflict upon orangutans left me appalled, ashamed of my own species, and determined to do whatever possible to redress the misery humans have caused. It is in fact impossible to repair the damage. Mother cannot be replaced, scars from captivity cannot be erased, and years lost to imprisonment cannot be relived. At best, we can help orangutans compensate for the losses. Even that takes years of intensive support. Orangutans may be lightning learners compared to other species, but it still takes them years to acquire the expertise to survive in the forest -- after their health, emotional, and motivational problems have been solved. Following orangutans in their Bornean rainforest homes meant that those forests became my home too, if only for a few months each year. So over the years, I also came to feel the threat of forest destruction, the greatest threat to orangutan survival today. Gold was discovered just upriver from the orangutan rehabilitation camp. It lured thousands of fortune seekers, who razed hundreds of acres of forest and polluted the river with their refuse, especially the mercury they used to extract gold. The forest along the river grew thinner each year as poachers felled more and more trees. Growing numbers of human immigrants encroached more and more often, and more and more deeply, into supposedly protected forest. Tourists flooded the forest to see orangutans; their legacy included encouraging orangutans to become moochers and spreading human diseases to the orangutan community. And in 1997-8, fires started by humans in their concessions, plantations and farmlands swept through many of the forests that harbor orangutans. Fifty percent of the forest I was working in at the time was destroyed, and many of its orangutans disappeared without a trace. Of the few we found, some were close to starvation and others were leaving the forest, probably forced out because the forest could no longer support them. It's not as if nothing is being done to protect orangutans. National and international laws protect them; the international media, conferences, documentaries, magazines, and books all publicize their plight; and international foundations and agencies pledge support for orangutan survival. Five rehabilitation centers in Borneo and Sumatra now work to return ex-captive orangutans to freedom and a sixth will soon open, and major efforts are being made to locate the remaining populations of wild orangutans and protect their habitat. The trouble is that the two great threats to orangutans and to their tropical rainforests -- predation and habitat destruction -- are outpacing these protection efforts. Another clue to the problem, I think, amounts to how we value things non-human. What we commonly offer orangutans is not what they need, but what we don't want. Given the vast amount of food orangutans need, most of it fruit, the best orangutan habitat is lowland alluvial and peatswamp forest habitat close to waterways. Most of that habitat is coastal since farther inland, elevation rises and less productive forests predominate. That habitat is precisely what humans prefer, too. In the face of that conflict, orangutan fates read disturbingly like those of many native peoples -- driven inland to less desirable lands by invading humans, and there often restricted to reserves or parks on land that the humans in control don't much want. One of the only chances for orangutans to survive requires humans to muster enough respect to grant them legal rights. Interestingly, because of their powerful minds, great apes qualify for basic legal rights under human law. The international Great Ape Project has been promoting this view and New Zealand is now considering acting upon it, the first country in the world to take this important step. It is the first to speak in terms of `rights' for apes and to prohibit research that is not in the best interests of the apes themselves. The idea is not so far-fetched: Only about a hundred years ago, western cultures didn't recognize pygmies as human, and it was only in this century that many western countries (including Canada) recognized women as persons under the law. If we've managed at least twice in recent history to open our minds about who is entitled to rights, perhaps we can do it a third time. Orangutans are just one of many species facing serious threats to survival at human hands. Unless we can develop more respect for life on this planet other than our own, it too will likely soon disappear.